Lanlee's Buster Brown ROM: Sable dog bred and owned by Ruth Anne Smith and whelped Jebruary 13, 1980. 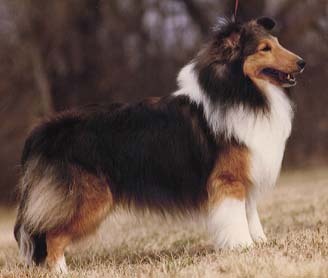 His sire was Am/Can Ch Harvest Hill's Shoeshine Boy, and his dam was Lanlee's Baby Snooks. Sire of 10 Champions, although he was scarcely used by breeders outside the Kansas City area. Although it is not obvious from the pedigree below, his sire was heavily linebred on Ch Diamond's Robert Bruce ROM, which makes him a Robert Bruce/Peter cross. He was Line CHE Part IIc and Family 2 Part II.